Law college in Punjab, After completion of graduation, lots of students get attraction towards LLB as they want to serve as a lawyer. The job is having lots of responsibility’s sometimes it gets involved with the reputation of an individual or reputation of the nation. Hence a balanced knowledge is always needed. By keeping all these scenarios in mind Universal group of institution is offering various courses in which Law is one and due to their best method of education in the respective field they are well-known law knowledge in Chandigarh Punjab.Law is something which deals with decorum of society and this needs to be followed by all the citizens of the nation, hence to groom the society in better way, Universal group of institution provides specialization in Law course as well, where an individual can learn about the constitution of the nation and how it should be followed by maintaining the discipline in the society. Universal group of institutions has well-qualified staff and they are getting hired through various levels of filtration. The institution works on the motto of quality. In order to maintain quality, the teachers should be fully groomed and confident so that they guide the new future of the nation in a much better way. That is why various levels are always followed during the recruitment of staff and when it comes to the course of law then we need to be 100% sure because the dealing is with the law of the nation. The way the universal group of institutions has worked in past decades is really commendable and now they are a well-reputed law college in Chandigarh Punjab..
Law is the only thing which is respected by everyone and before taking any step each and every individual fulfills the formalities in legal terms. These actions are important in order to avoid all future disputes. Our experts are very well aware of these kinds of practical scenario and hence they train students in such a manner so that they could do their best in the future. Here students will get an opportunity to learn under the guidance of experts of the law who are serving from past decades and have all the concepts at their tips. Hence if you are willing to make your career in law, then just browse for law College in Punjab Chandigarh. You will find the Universal group of institutions as one of the options. All required details are available hence if you get satisfied then an online application for the law course can be done. As Universal group of institution always measure their success with the success of students and hence the best professionals are hired for delivering the correct key concept. Directly or indirectly we are building the nation hence it’s our prior responsibility to graduate each individual with transparency so they could serve the society in the much better way and by doing these kinds of practices we will be called as best law college in Chandigarh Punjab. As the crime is increasing day by day and we need to make society a better place to live. We create minds in such a way so that they could analyze the culprit in the shortest possible time frame with accuracy. As we know crores of cases are pending and we are lacking in terms of good lawyers, so the universal group of institutions is working with a single objective to deliver best lawyers to the society so that we could have a safe and happy environment to live. So now search for Law college in Punjab is over, just share your details at the web portal of the institutions and our team will provide you best possible solution. 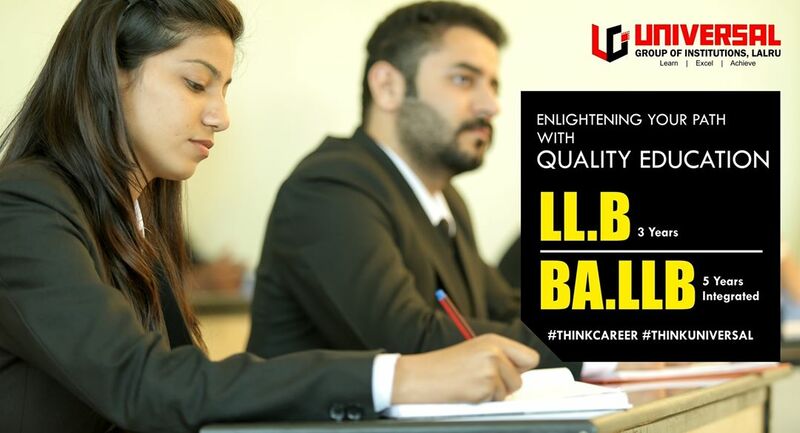 After completion of Bachelors degree, the student can enroll for LLB which will be of duration 3 years. Here, comes the best option for Law course. Universal group of institutions is providing all solution under one roof. 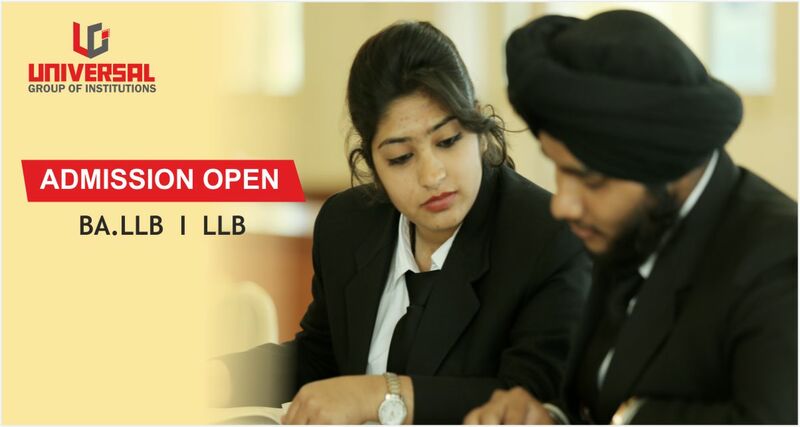 Check out the details now and get the best law college in Punjab. Good luck.